We are really excited to announce that the band have been asked to support The Who on 3 dates for their upcoming tour. They will play the Phones4U Arena (previously MEN Arena) on 13th December and The O2 Arena on 17th and 18th of December. Langtree Park, St Helens. Saints Rugby League are about to face off with Catalan Dragons in the Superleague semi-finals. The two teams are warming up at either ends of the pitch and in the centre, the band are playing some good old fashioned rock and roll. The band received a warm reception at the ground. The MC even mentioned the band's connection with Saints, citing the fact that Louis used to play for their academy team, a few years ago. After the set the crowd gave the band a rousing send off. The lads now look forward to another pre-rugby gig on Sunday at Headingley in Leeds, as Leigh Centurions play Featherstone Rovers in the Championship Grand Final. 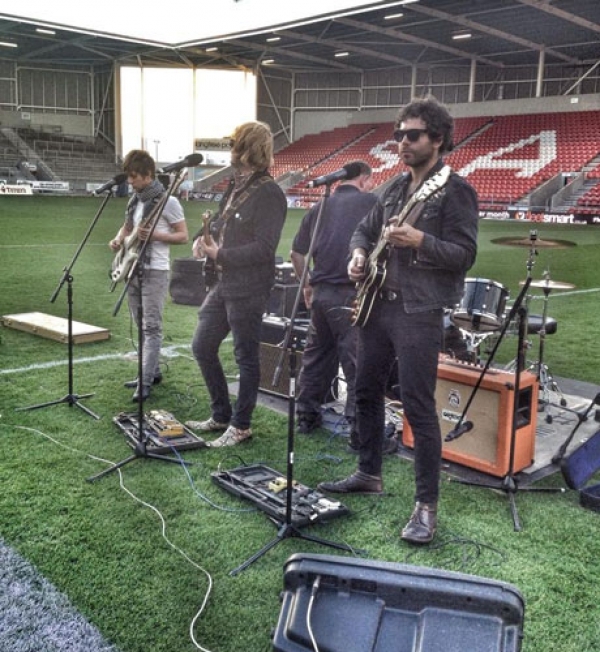 The band will be performing a set at Langtree Park ahead of St Helens' clash with Catalan Dragons in the Superleague Play Offs semi-final this Thursday 2nd October. 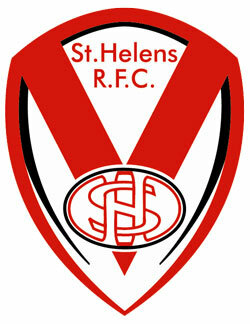 The band have a connection to Saints Rugby League as lead guitarist Louis Menguy used to be signed to them as an academy player. The band have been asked to perform a short set at Headingley (Leeds) as Leigh Centurions take on Featherstone Rovers in the Kingstone Press Championship Grand Final on Sunday 5th October. At the time of writing they are still voting on Scottish independence but regardless of the outcome, the band will head North to play Cafe Drummonds in Aberdeen. The night is being organised by Manchester based Mancunia Promotions who have asked the band to play for them a number of times in the past. For more information see the Mancunia Promotions website. 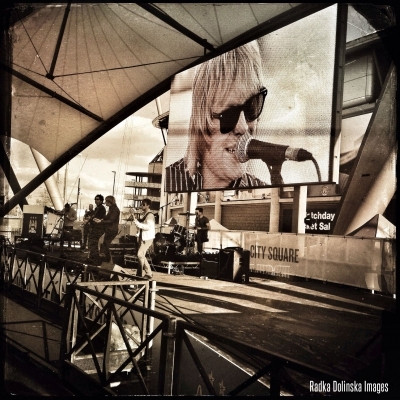 The gig at the Soccerex Football Festival on Sunday 7th September went down really well. Here's a shot of Dean on the big screen. The band are playing at Soccerex Football Festival on Sunday 7th September. The festival is at Etihad Stadium in Manchester. The festival is free so head along and see some familiar football faces such as Louis Saha, Gianfranco Zola, Bryan Robson (to name but a few - full list here). On 29th August the band will descend upon former Blur bassist's farm in the Cotswolds to play the Big Feastival, a festival of food and music. Tickets are available from the official website. The band played Queen of Hoxton again on Saturday and once again showed why they are band that NEEDS to be seen live! They even met with Mr Nice himself, Howard Marks who is to narrate the upcoming documentary Down With The Mockery. The Dubai gig went down a storm and the lads loved every second of it, as well as the added bonus of basking in the desert sun!